Humanity seems to be going through some sort of Dark Ages. Some people who speak in the name of their religions have completely gone berserk. In the name of God, many men, women and innocent children are being bombed, killed, and yes, beheaded. For the life of me, as much as I try to understand the roots of conflict in different parts of the world, I cannot wrap my head around any justification for such barbaric behavior. We are in the 21st century. Humanity has seen many periods in history, which I would imagine should have taught us valuable lessons. Apparently, I am mistaken. The events in the news are simply crazy, unjustifiable and inhuman. Sometimes I wonder if we are we losing it as a species. Throw in old issues that remain unsolved and unaddressed. People of the world, climate change WILL do us in at the rate we are going. It is already beginning to do so. It will not be just the low-lying islands that will experience catastrophic consequences, ALL of us will see within our lifetime an earth less and less conducive to life, and all in just a matter of decades. And yet, we continue to do business, feed our unsustainable economic systems and consume as we do oblivious to all the signs that tell us we must stop doing it. Hunger stalks many parts of the world. There is still a lot of poverty that needs to be wiped out. Terrorism is on the rise. New diseases are plaguing us. Wars have broken out in many parts of the globe. It feels like the balance of things has tilted somewhat to a darker side. I find myself confused, demoralized, and very sad about the state of affairs of the world. I try to imagine what it must have been like to have lived through the Inquisition, the Crusades, the many wars over religion and politics, the Black Plague, the big World Wars, the Holocaust, Pol Pot’s rule, etc. when the world seemed cruel and insane. Imagine the horror of it especially for those who refused to silence their consciences and fight back. While many otherwise sane people marched with the lemmings of darkness, the mobs of insanity, prejudice, false righteousness, there were those who did not lose themselves. These were the people who stood against the tide of negativity. They must have mustered every strength they could to resist the madness. Through the hardship of it all, they managed somehow to keep their humanity intact sometimes by their own lonesome selves. Thank God, world history eventually moved on somehow and saw itself go through periods when mankind bloomed and the world looked more promising. But all is not well again. Sometimes I wish I could join a spontaneous gathering of people who feel the same as I do and just have a collective cry, and feel assured that on this side of humanity, we have not gone mad. Sometimes, I ask myself if ordinary people can do anything. My common sense tells me that it will be incumbent upon everyone to contribute to the solutions needed. We all hold a piece of the peace, and we must put them together. So, what can we do? A lot. We may not hold the levers of power, money, military might but we are not entirely helpless. In the spaces we occupy, in our own lives, we can be responsible enough and guarantee that we will hold the peace as best we can. How? Let me count some ways. 1. Let’s be kinder to everyone including strangers that we meet. The simple act of smiling, or giving way during traffic, the kind words we utter etc., may be enough to give anyone we meet a lift for the day. 2. Let us be respectful and tolerant. Let us not lord our religious beliefs on people who do not share our values. Let us not fight or name-call. When the heat of discussion is too much, let us not fall into our ego’s need to win. It is ok to walk away. Let us know the wisdom of knowing when NOT discuss religion, politics at all. 3. Let us clean our surroundings. Pick up garbage in front of our homes. Do not litter anywhere. And let’s be mindful about what we do that contributes to waste, pollution and degradation. 4. Let us always be mindful of the large gap between the haves and have-nots in the world. When we can (and we can most of the time), let us share things, give away stuff that may be useless to us but useful to others. Or better yet, give away some valuable stuff. Sometimes, it is not giving until it hurts. Maybe we can contribute to scholarship programs that get more people educated, or a feeding program to get kids healthy enough to study and concentrate the whole day in school. 5. Let us get out of the culture of blame and simply do what needs to be done and fix what needs to be fixed. If anything festers and no one is doing anything about it, maybe we are being called to do it. 6. Let us imagine the ordinary to be sacred. It may start with imagination but sooner or later, it becomes a realization that there is nothing ordinary about anything. Everything is laden with poetry, enchantment, and the Spirit that animates the universe. When we awaken to this, the quality of all our experiences is elevated. 7. Make it a practice to look at our enemies, people we despise as whole human beings. It is easy to demonize. We may disagree with them, or even find them repulsive but let us not forget that they are humans like us. This view does not preclude justice. It still must be served but with less vengeance and revenge, and more of hope that they reform and feel atonement. 8. Lastly, we serve the world when we are happy. Happiness, passion are our mission in life. Find the inner space where your wellspring of happiness resides. Drink generously from it and spread the happiness around. By doing these, maybe we can drive away some of the darkness that seems to envelop the world, or at least light up the dark spaces in our own lives. I learned something very interesting recently. The words “five” and “one,” when said sequentially, sound like “I want” to those in mainland China. I was invited to give a talk to teachers who worked for a company called 51Talk. I talked to them about the noble profession of teaching and how much a teacher can change a person’s life and even his or her destiny. This was not the usual kind of teachers who teach at schools or universities, although many have done so in the past. Almost all had a few years’ experience doing that, and some are still doing so. One thing in common with all of them, whether young or old, is that they have now embarked on a new path of this old profession. They now teach online. And what do they teach? They teach English. Who do they teach? They teach middle class Chinese in China. There are probably not more than 5,000 foreign English teachers in China. To hire them on a one-on-one basis is quite expensive. And while many Chinese learn English in regular school, the quality is quite low and, in the words of an educated Chinese person I talked to, “practically useless.” People who study in good schools and gain a high level of proficiency in China describe the average use of English as “dumb English.” Not only is quality sorely lacking, the graduates have very little chance to practice with real English speakers. The biggest English language teaching company in China, New Oriental, will help you pass TOEFL tests by teaching you more about how to get around the multiple choices to pass the exams, but not how to speak the language with great proficiency. Enter a startup called 51Talk. CEO and founder Jack Huang and Shu Ting, co-founder, recognized a great thirst to learn conversational English among Chinese in the Mainland and decided to do something about it. Initially, they looked at different Asian countries to search for the best talents they could find to teach their countrymen, only to discover that the best teachers were in the Philippines. They found Filipinos to be very proficient, friendly, patient and there were so many teachers available. Our American style of English is also something that the Chinese seem to like. In the beginning, the idea of Filipinos teaching Chinese to speak English was a hard sell. But the moment their clients tried the course, they were hooked. In three years, 51Talk has provided freelance jobs to more than 1,500 Filipino e-Educators. They are projected to reach 3,000 teachers this year and double the number by next year. Teaching hours are from 6 a.m. to 12 midnight every day. That does not mean all those hours are occupied. Teachers are on standby. Chinese students buy credits for 25-minute classes. They have lessons when they want and they can choose the teachers. The suggested schedule is three times per week per student, but that is flexible. The approach to learning English is through total immersion. The teachers speak only in English but they follow a software instruction program that plays according to the student’s level of proficiency. The setting can be anywhere. All a teacher needs is a strong Internet connection. The interaction happens via Skype. The teachers work mostly from their homes, which means they have no transportation costs. Beijing and Manila are in the same time zone so it not like working in a call center where your life is totally disrupted by the time difference. It is not stressful since they are in their element. They can take meals, or refreshments in between. The good teachers can earn up to P70,000 a month. The teachers and students, as well as the sessions, are evaluated by an academic standards team both here and in Beijing for improvements when needed. I watched an actual session a few days ago and I was quite impressed at how easily it works. There is a real conversation going on. The teacher asks the students to pronounce certain words a few times, answer a few questions from preview sessions and tackle new lessons. The exchange is quite fast. There is much enthusiasm between teacher and student. Do the students learn? I learned from the 51Talk executives that in a little over three months, Chinese students report a much greater comprehension when watching a regular American TV drama. Young Chinese who know how to communicate in English have a much better chance at getting better jobs. The demand to learn it is unquenchable. And the opportunity to provide the service is clearly there. Many Filipinos through the decades have gone abroad as OFWs and have often had to give up being with their families while they work hard to earn a living. The social cost of this cannot be accurately measured but we know that as a society, we are paying an enormous price. 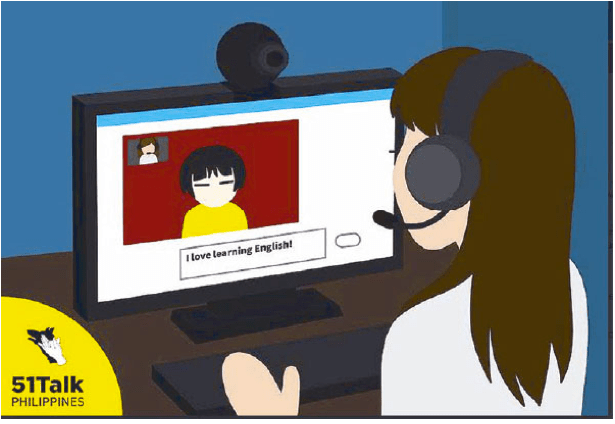 In this setup where Filipino e-Educators are engaged in teaching online to students abroad, there are no families to leave behind. There is only productivity and pride in doing the work they are good at and like to do. Lastly, in this age of tension between Philippines and China, I am pretty sure that ventures and exchanges such as this can only bring greater understanding between peoples of both countries. To paraphrase an ancient saying, the Chinese students have long been ready, and yes, the Filipino teachers have appeared. To learn more about teaching, visit the 51Talk Facebook site and fill out an application form.